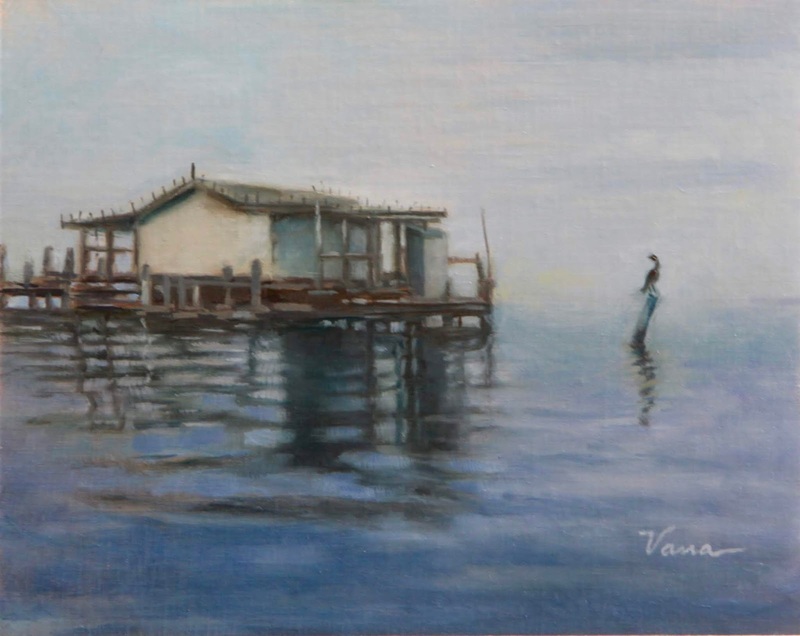 I painted this old Florida stilt house from a photo taken by my husband one morning while he was fishing in the Gulf of Mexico. It was a misty morning with barely a horizon. 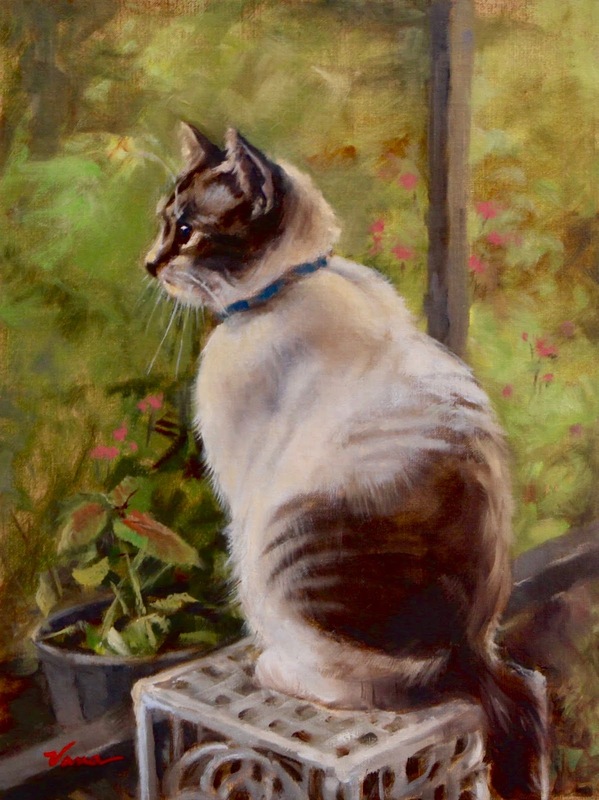 Subject: Sophie, the subject of this painting, is a stray cat who came into our lives in 2017. She has exceeded all our expectations by giving us more love and entertainment than we could imagine when she first showed up, hungry and sick, to our yard. She finally won us over when she parked herself outside our French door on the coldest night of the year. My husband Rick quickly rigged up a box for a bed and put it beside her. In a few minutes she had climbed inside it and we knew we had to take care of this friendly cat. Many trips to the vet followed and she was finally cured of her various illnesses. Thankfully, she had none that were incurable. Funny note: When Sophie is hungry she takes to throwing items off the counters. She starts with cat bowls and progresses to whatever else is handy. She's very creative--must be her time out in the wild! Method: For this painting, I tried to follow Richard Schmid's advice to make the focal point the most detailed and in-focus part of the painting. This to me meant Sophie herself. I can never be a great painter like Schmid but I am learning from his advice in his famous book Alla Prima II (which is the revised version of his Alla Prima). Any realistic/ impressionist artist who doesn't own this book should immediately buy it. You won't regret it--and I'm not paid by Schmid to say this! Final comment: I was accepted into Oil Painters of America recently and this painting was one of two that I submitted. In addition, Sophie helped me win 2nd Place at the Pasco Fine Art Member's Show last night. She's coming up in the world: last month she helped me win a 3rd Place with another painting of her.